CCI: Beloit and Beyond | Corporate Contractors Inc.
Our thanks to the Beloit Daily News team who featured CCI in an article within their exceptional Stateline 2019 Yearbook publication. This special yearbook is packed with interesting content and colorful photographs that focus on the numerous achievements of the people, companies, and organizations in southern Wisconsin. Even more, it highlights the many reasons people are proud of the Stateline area and why they are looking forward to a bright future! If you’d like a copy, please call the Beloit Daily News office (608-365-8811). 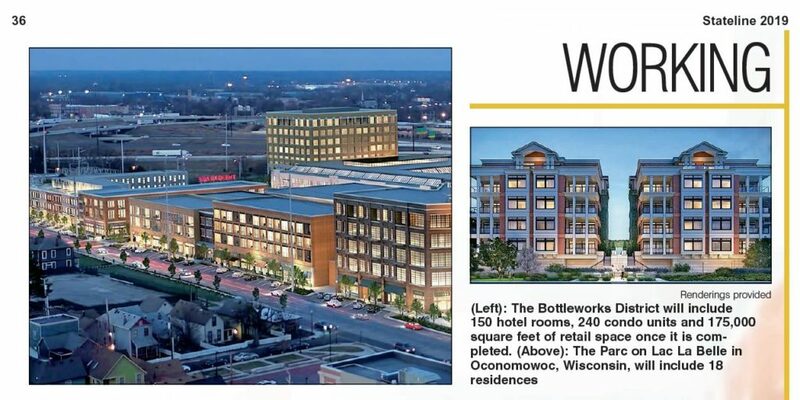 Shown below, the CCI article highlights several projects including, the Bottleworks District, Sand Valley Golf Resort, Clearpoint Apartments, The Parc on Lac La Belle, Beloit College Powerhouse, and more. BELOIT — People who live in the Stateline Area have become very familiar with the many local construction projects by Corporate Contractors Inc. (CCI), which is a key part of the Hendricks companies. The projects in Beloit range from the current construction of the Beloit College Powerhouse recreation center, to the recently completed facility on Stateline Road that houses Seal-Rite Door, to the numerous projects in downtown Beloit. However, the work of CCI is far-reaching and the projects are widely diverse. Projects include work at a new golf resort in Adams County, Wisconsin, to an expansive project that will include condominiums and retail space in Indianapolis.